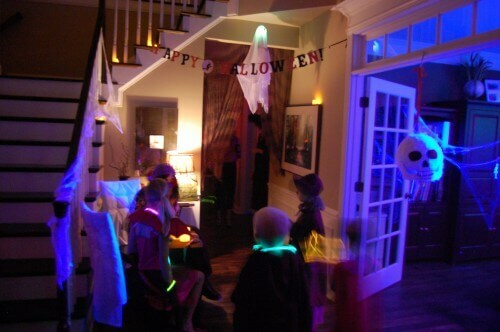 Home » 100 Days on a Budget Series » Budget Day 29: Halloween Partaaay! This is going to be one complicated week when it comes to budgeting. First of all, our Halloween Party (which involved feeding dinner to 90 people) was of course not included in our weekly grocery budget of $125. Let’s just say we spent even more than that on just the one evening of food for everyone! And we ended up with some leftovers after the party, which we’ve of course been eating (and didn’t technically “pay” for out of our grocery budget). The second complication is the arrival of our first set of extended houseguests since starting our budget. You obviously need extra food for extra people and I don’t know about you, but when the houseguests are my parents they inevitably end up buying some groceries of their own (more on that later)! Cute little white ghost cupcakes made with plenty of sugar! Our friends of course know all about our real food adventures so the cupcake thing really threw everyone off. So many people came up to us with their cupcake and said “do these have sugar in them?” or “are they organic?” I just had to laugh. Breaking “the rules” is certainly okay in moderation, and there is no better time to do it than Halloween!! Not to mention that our dear friend with a cupcake business made them from scratch for us so I know she didn’t use any funky ingredients. We did get a lot of nice compliments about the dinner though and one neighbor even told me that she woke up feeling so great the next day because she wasn’t sitting around eating junk all night like people normally do at parties. It was fun, but I am not committing to serving dinner to 90 people again anytime soon (if ever!) LOL. 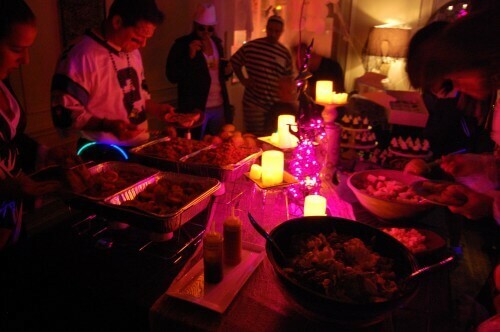 I included some extra pics of the non-food part of the party since we worked so hard on all of the décor! Halloween weekend was capped off with a fun evening of trick or treating. As previously mentioned our plan was to let our girls each eat 5 pieces of their choice and then we would “buy” the rest from them (they could save their 5 pieces or eat it all at once…it was up to them!). My oldest daughter ate 4 of her 5 before we even got home from trick or treating. What can I say….I guess she’s missed candy, although I don’t think she is necessarily a “deprived child” when it comes to the sweets and junk they give the kindergartners at school. My other daughter was not quite as rushed to eat hers (thankfully). After figuring out what pieces they would keep I have to say they appeared to have loads of fun counting up (and handing over) their pieces to get quarters in exchange. We were originally only going to give them dimes, but a blog reader actually gave us the wonderful idea to not just do this for Halloween…but to do it all year round whenever they are given candy! We were worried that dimes wouldn’t amount to very much during those non-holiday periods of time, and the plan is to let them buy a toy of their choice with their money. Doing this for my girls makes me feel like this might just be the perfect balance between those fun and carefree childhood experiences, and not going overboard….which I am thrilled about! Some of you may be wondering if I ate any candy? Especially those friends who knew me in my “previous life” because I was a candy hound! In the old days I could barely keep the Halloween candy in my house because like an idiot I would buy my favorites and eat most of it before the big day. All I have to say is that this year I only ate two little snickers and they were mmm mmm good! That is it though…moderation is key, which certainly made this feel like the “special occasion” that it should be. I love all of your decorations! Sounds like a fabulous party. Thank you! It was a good time, but A LOT of work too! We budget every aspect of our financial lives, including groceries. However, when we know that we will be with in-laws and more food is required, we simply budget more for that week. It is not worth the stress and worry you will inevitably experience trying to feed extra people on your budget for 4. We usually add $50 or so to the grocery budget for the week and then I am able to be a gracious hostess and have lots of delicious food around. I think it makes guests feel unwelcome if they feel the tension of the budget, or the lack of food around while they are visiting. Cut yourself some slack and just add to your budget that week. You’ll be glad you did! I love your idea of deciding exactly how much extra you will spend for guests so you don’t get too far off track. 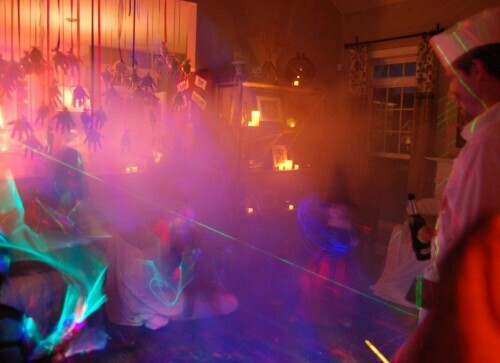 I definitely don’t worry about a budget if I’m throwing a party or having guests. It would be too many things on my plate for sure! I spend half my day thinking about food and recipes, and whenever I come across a great whole food tip lately I think of you. The best two I found recently are right up your budget alley! 2. Read somewhere to save carrot tops and those inner-but-unusable onion layers in a bag in the freezer to use for stock. Duh! What a great tip! 3. I get a lot of recipe inspiration from my Everyday Food and Cooking Light magazines. It’s especially helpful for buying and cooking in season, because they typically have recipes for whatever season we are in during the issue. I read a prior posting and I would love to get your recipe for the whole-wheat Mac & Cheese! Could you post it? I love your website! We are just starting our organic journey and your family is a great inspiration. Thank you! So glad to hear that and thank you for leaving a comment. Wow! What a party!! 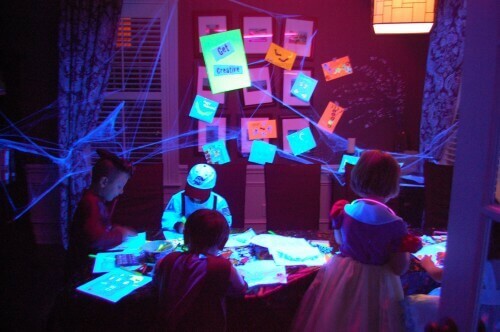 How did the trick-or-treaters like your toys instead of candy? I know this is old, but I just finished the original pledge and I am reading this one now. I am so confused. The first 100 days, Lisa wouldn’t eat her mom’s whole grain blend pasta and such and no she is eating Snickers and Noodle and Company. Did I miss a change in the rules or is it because she is on a budget that she is feeling discouraged and cheating more?